Question 1: If my diameter is only 7.44 inches, why am I unable to lay the fan blade flat (see below - notice the dimensions are within the bounds)? Question 2: What is so wrong with the surfaces in red that Cura cannot print, even with supports? I am using PVA as a support material, yet there is something wrong with my model in Cura. I checked the X-ray view and nothing seemed amiss. 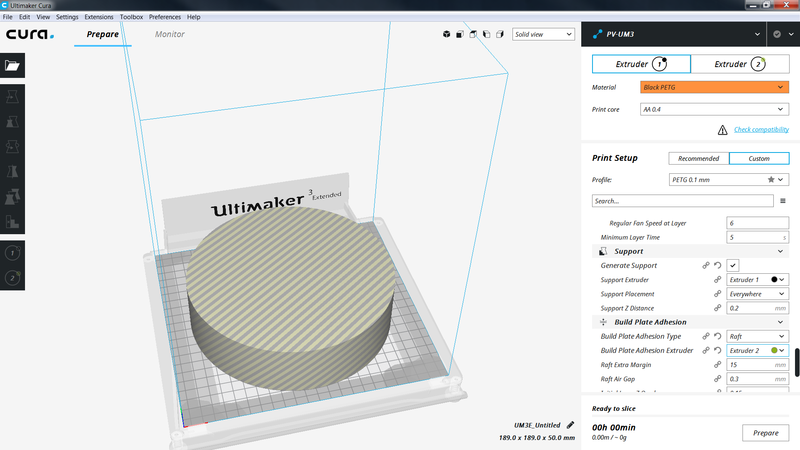 Ultimaker Cura print bed size sizes (shrinks) when you enable skirt, brim or raft build adhesion options. Try to print without build plate adhesion option if you want to push printing to the limits of the build plate. Furthermore, you mention the use of PVA, using 2 cores, the priming print tower also needs space to be printed, this can be also limiting your build plate space. Note that you can define where to print the tower, you could try locating it in a corner where the fan does not reach. As an example I have made a 7.44" cylinder of 2" height and put it onto the UM3E build plate to show the differences when you use dual extrusion. 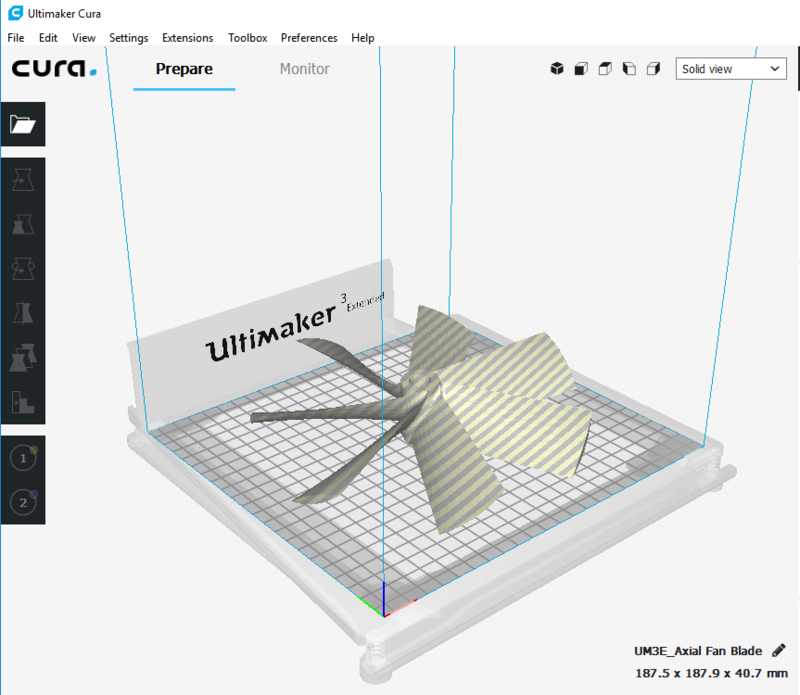 Having an Ultimaker 3E myself, printing PVA might not be very good choice as you need to print a lot of support material when printing upright. PVA cooks easily even in the B core, it also needs to be very dry, PVA takes up moisture very fast and becomes useless after that. At work we have much better experience with break-away support material. Another consideration why you should not print this upright is the orientation of the layers. It is generally known that the layer to layer bonding is less strong that the material itself, it at least provides a lot of notches from which cracks can initiate and grow. This means that if you want to print this, you should lay it flat, this way the centrifugal force is in line with the layer deposition direction. 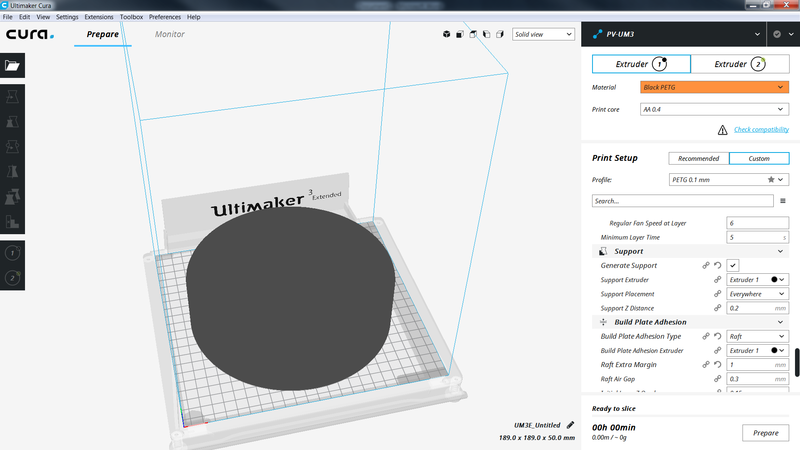 With the correct layer height (read thin layers), you should be able to print this flat without support. I have printed similar structures like turbo turbine wheels with similar overhangs without support. Thanks for contributing an answer to 3D Printing Stack Exchange! Not the answer you're looking for? 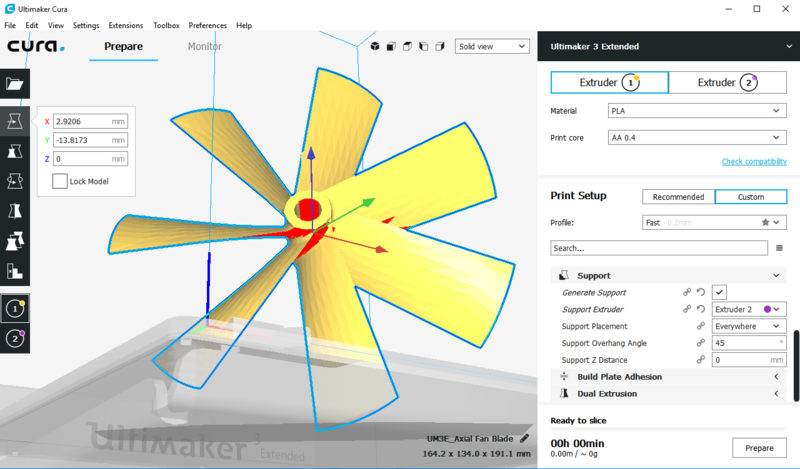 Browse other questions tagged cura support-structures build-plate or ask your own question. Scratches in the build plate - How did this happen, and may it cause problems?